The Internet of Things (IoT) is a computing paradigm whereby everyday life objects are augmented with computational and wireless communication capabilities, typically through the incorporation of resource-constrained devices including sensors and actuators, which enable their connection to the Internet. The IoT is seen as the key ingredient for the development of smart environments. Nevertheless, the current IoT ecosystem offers many alternative communication solutions with diverse performance characteristics. This situation presents a major challenge to identifying the most suitable IoT communication solution(s) for a particular smart environment. 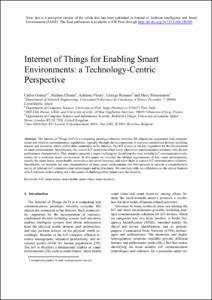 In this paper we consider the distinct requirements of key smart environments, namely the smart home, smart health, smart cities and smart factories, and relate them to current IoT communication solutions. Specifically, we describe the core characteristics of these smart environments and then proceed to provide a comprehensive survey of relevant IoT communication technologies and architectures. We conclude with our reflections on the crucial features of IoT solutions in this setting and a discussion of challenges that remain open for research. Gomez, C. [et al.]. Internet of Things for enabling smart environments: a technology-centric perspective. "Journal of ambient intelligence and smart environments", 24 Gener 2019, vol. 11, núm. 1, p. 23-43.